I have been working with some brilliant colleagues and collaborators to set up a new ‘Digital Geographies’ speciality group up at the Association of American Geographers. The AAG is currently reviewing our application package. But what you can do in the meantime, is sign up to our newly-created mailing list (set up by the tireless Jim Thatcher). 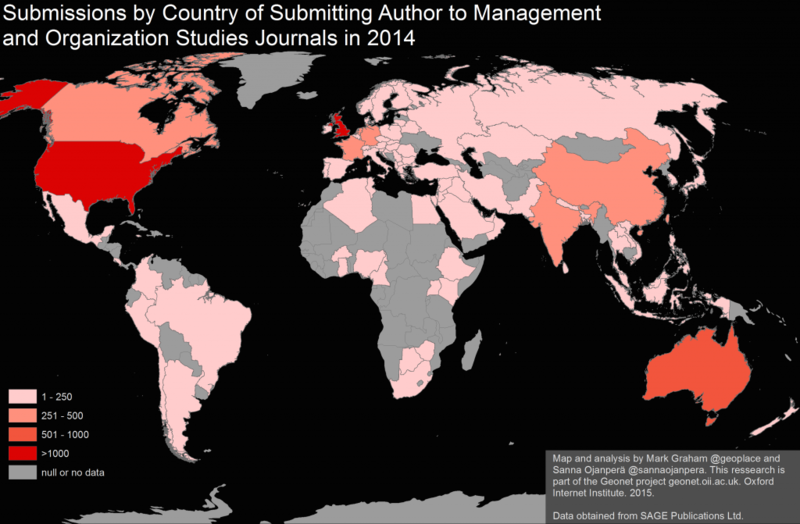 Our team recently had the opportunity of working with some submission data from Sage journals. Amongst other things, the data tell us where authors of articles come from, and primary discipline of the journal they are submitting to. 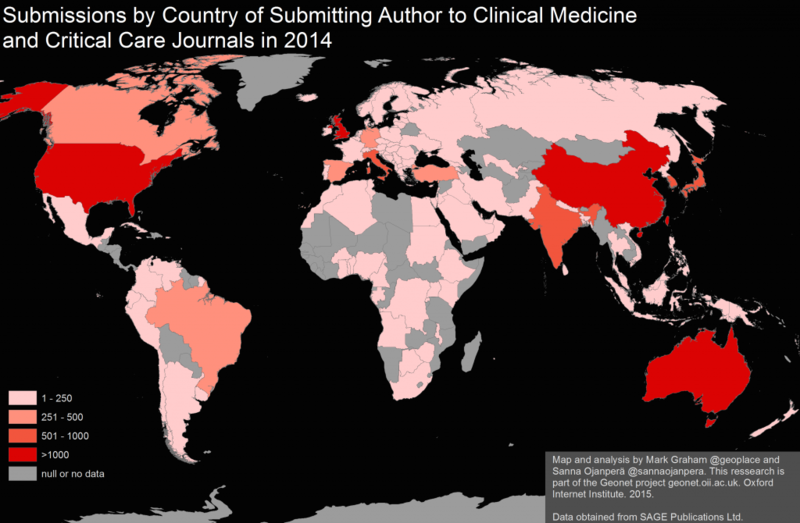 We therefore decided to map out the geography of submissions for journals in five categories: Communications, Clinical Medicine and Critical Care, Cultural Studies, Engineering and Computing, and Management and Organization Studies. A few broad patterns are apparent here. 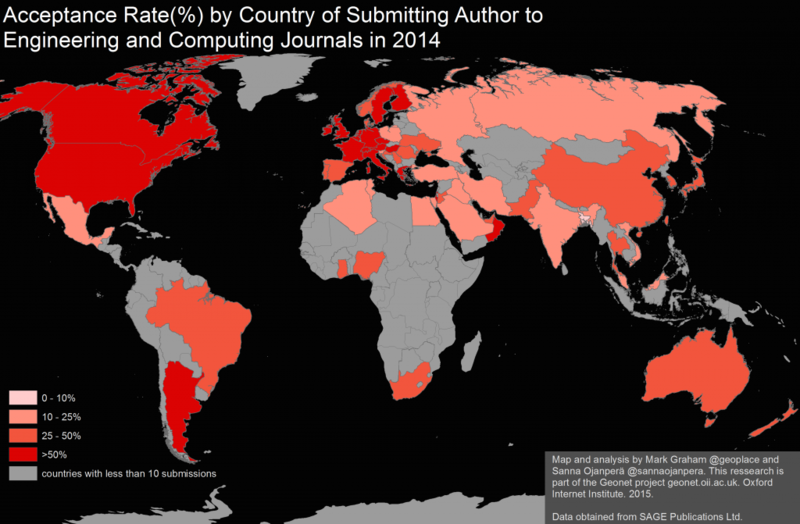 First, we see way more academic content coming from the Global North than from the Global South. Africa in particular is notable for its absence. Most countries on the continent fail to register even a single journal article submission. 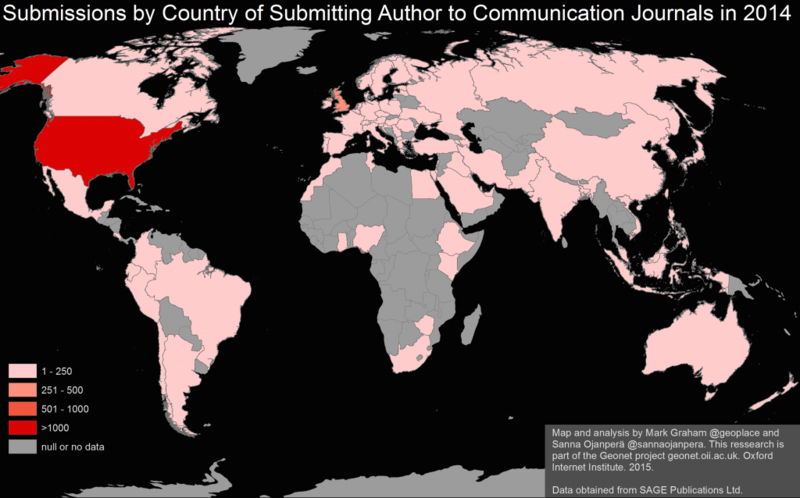 Second, there are only two countries that register a consistently large number of submissions in every category: the UK and the US. This relates to the third point: that a handful of Asian countries (i.e. 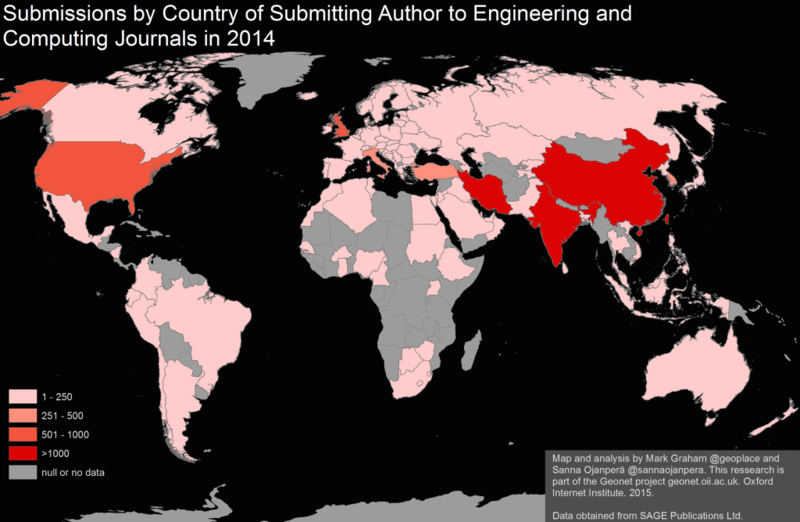 China, India, and Iran) register a high number of submissions only in STEM subjects. 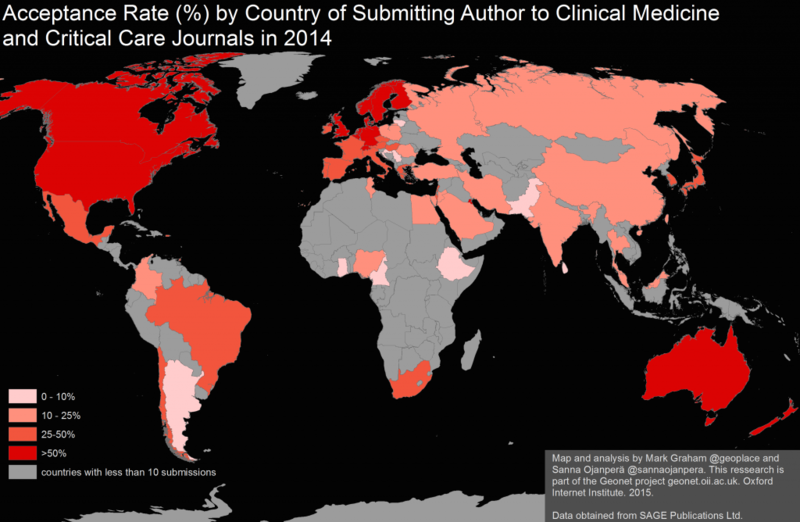 Here we see that Northern Europe and North America have relatively high acceptance rates across the board. Relatedly, not only do a lot of countries in the South have particularly a low number of submissions, they also have very low acceptance rates for the small numbers of submissions that they do have: further deepening the geographic divides in knowledge production. Sanna Ojanperä, Stefano De Sabbata, and I plan to explore some of these patterns in more detail in an article we are writing. But, in the meantime, please let us know if there are any questions about these preliminary patterns; or if there are any questions you would like to see addressed. Graham, M., Straumann, R., Hogan, B. 2016. Digital Divisions of Labour and Informational Magnetism: Mapping Participation in Wikipedia. Graham, M., De Sabbata, S., Zook, M. 2015.